The story of a murderer-several murders by Jean-Batist Grenui in the name of making perfect parfume. (story based on Patrick Zuiskind ”Parfumer”). Astigmatists see the world differently, but even they are different from eachother. Unsatisfyed grandfather is trying to defend family traditions. One Act Comedy "Don Juan"
Young Don Juan walking from house to house to his lovers with his servant-Sganarel. Suddenly on the square they meet Commodore’s statue. Comic story about why does Don Juan left the city and for whom he came back. “Igi” is the stage version of one of the remarkable stories written by Jemal Karchkhadze, the 20th-century Georgian publicist and writer, which tells the story of human evolution, from prehistoric times to the formation of personality and the fight with the environment and society since then. The play comprises from several novels: "A Beautiful Morning”, ”The Artist " (Niko Firosmani), ”The Cinema”, ”Shirley Bassey”, ”Host and Guest”, ”Bohemian Rhapsody”. 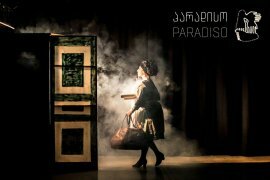 "Our Theatre" presents one act play wih puppets - "Paradiso". The story takes place in elderly shelter where three old man with different nationality together count on their last days on earth.